The duathlon has been staged for over 20 years in various formats. The event is run annually in memory of Ian Hesketh who tragically died at the tender age of 27 in 2005. Ian was a member of Horwich RMI Harriers since he was 8 years old and Rivington was his favourite training area. He was a lifeguard at a leisure centre in Bolton and cycled to and from work every day. The duathlon centres entirely in the Rivington area, with Rivington Primary School as the Start and Transition Area. This makes for a secure location for leaving bikes and belongings. The course suits both beginner and experienced athletes and the scenery is some of the best outside the Lake District. The two 5k runs are almost entirely off-road on tracks and paths and the cycle section is three laps with two small hills on each lap. Entries are 'NOW OPEN' on the Bookitzone website !!! Please see our enter event page for more details. We also have a Memorial Duathlon Facebook page for anyone interested. We are always on the look out for an event sponsor, if you are interested and would like your advert on our home page and a link to your website, please get in touch to discuss further. Our old website is still online and available to view, please see the link below should you want to view it. 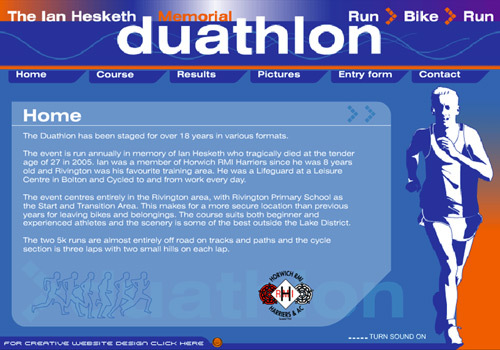 The Ian Hesketh Memorial Duathlon is a non profitable event. We pride ourselves on donating to a different charity/s each year and invite them to come along. We also have generous prize giving and T-shirts are given away to all competitors and marshals and we make a donation to Rivington Primary School for kindly allowing this event to take place on their grounds. Finally, a donation is made to Horwich RMI Harriers. Please see our charity page for more details on this charity and others we have supported over the years.